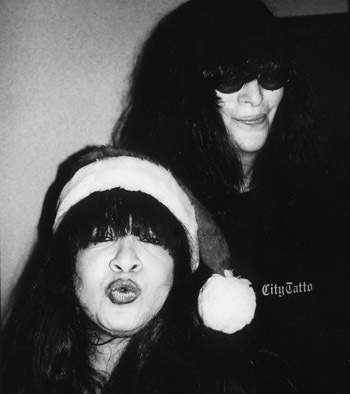 I’m sorry to have to tell you that the Mayor Of The East Village Joey Ramone died this afternoon. He died from lymphatic cancer. His mum Charlotte said he was listening to U2’s In A Little While in his room at New York Presbyterian Hospital when he died. “Just as the song finished, Joey finished,” Charlotte said. He was 49. Only a month or so ago I saw him on his perambulations, gangling down St. Mark’s Place, this rubbery creature who towered giraffe-like above the gaggle of excited Japanese girls who formed a moving clucking mass around him as he walked. And as he walked his neck craned down to meet their smiling upturned faces, this most unlikely – and enormously likeable – apostle of cool, mane of black hair blowing this way and that, automatic hand tugging it back, those yellowy-orange prescription shades like the bottoms of milkbottles that when the light hit them in a certain way you would see those bulbous eyes that he hid from the world, these eyes still excited by the quest but equally – more? – still shy and self-effacing. Just the singer in the fastest, blastest, tightest, rockin’est, coolest band of their magic moments. First time I saw Joey was at the Roundhouse in 1976 when the Ramones blitzkrieg bopped into London for the very first time, waving a ‘Gabba Gabba Hey!’ placard and taking no prisoners. It was the Bicentennial Fourth Of July, a fact trumpeted by these feisty young American invaders from Queens, New York. Bloody hell. 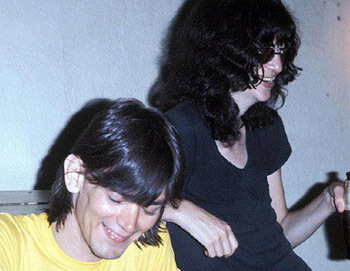 The Ramones nailed ev’ryone to the wall. Johnny’s chainsaw guitar, legs apart, moptop flying. Dee Dee’s barked exhortations of “1,2,3,4!” Tommy attacking the drums like the bloke from Black Sabbath on Lemmy-quality speed. And in the middle at the front at the mic stand stands the human stick insect Joey Ramone, a mess of hippy hair at British punkdom’s Damascus, the hand holding the mic drowned by this scraggly waterfall of Woodstock visual, the face virtually absent, this humanoid freak looking like a geek and singing like Adonis. Make no mistake, Joey was a romantic. And on top of this full-speed full-tilt amped-up electric mayhem there’s this voice of pop that when Phil Spector finally got to produce the Ramones – ‘cos he did and even if it was mad and even if it was crazy which of course it was because that’s just the way it is sometimes with ol’ Uncle Phil, well it was fated and that’s it. Anyways… down the line Phil gets to produce the Ramones and he takes this Joey voice, this perfect pop voice for today people and he melds it to Baby, I Love You and God forgive me but it’s as good as Ronnie Spector’s immaculate vocal on the Phil Spector-produced original by The Ronettes. But while Mrs. Spector had sang it with wet-lipped joy and celebration, in Joey’s reading it was as if he was pleading his love. It was beautiful. There on St. Mark’s Place we nodded greetings at each other. Joey had always been one of those characters who you weren’t really sure if they actually remembered you or not, he seemed so gently affable but kinda out there at the same time. The Boomtown Rats did a tour, their first tour of England proper, supporting Talking Heads and the headliners the Ramones, in 1977. 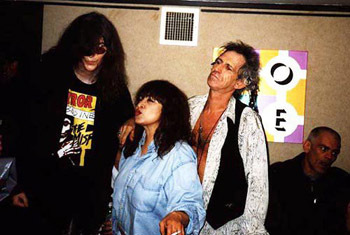 Joey was the same then, Mr. Vagueout dreamin’ his dreams, charismatically freakish on stage and genuinely sweet to the ever-awed fans who crowded into the dressing-rooms after ev’ry show. Then another BP charge with the unlikely name of Snips, a mate of Chris Spedding who’d sung with Ginger Baker, Snips landed the support on the latest Ramones tour. This is ’78. On the plane to Belfast I find myself sitting next to Johnny Ramone, Mike Clark Byrds hair framing a tight face. “How old are you?” I say idly (as one does…). Johnny thinks about this for a while, then ponders the question a bit more, then drifts into further cogitation. Finally, he takes in air and says, with great consideration, “Mid twenties”. Dee Dee was another story altogether (see BP Moves Into Chelsea Hotel, Dee Dee Visits. Weird scenes from inside the goldmine vol. 69). So on St Mark’s Place a few weeks back, we nod our greetings and amble on by. I never thought I’d never see him again. 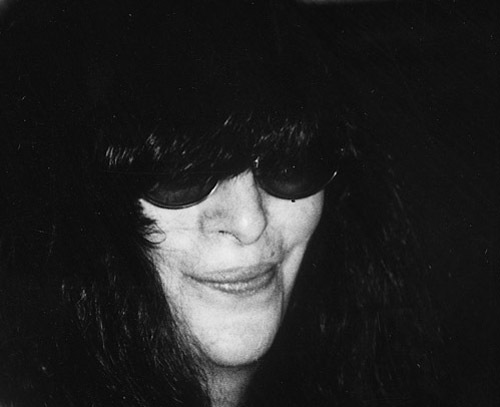 God bless Joey Ramone. Gabba Gabba Hey! – BP Fallon, East Village NYC April 15th 2001.